Brighten your day with this refreshing, citrus-infused mango drink. 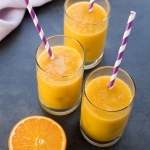 The main ingredients for this vibrant drink are simple: oranges, frozen mango and chia seeds. No juicer required! Cut orange in half, peel the skin off and remove any seeds. In a blender, add all the ingredients: 1/4 cup water, orange, frozen mango, chia seeds and any optional add-ins. Blend, scraping down the sides as needed. If too thick, add an additional 1/4 cup cold filtered water. Enjoy immediately or keep chilled until serving. I do not recommend making this too far in advance as the chia seeds will plump up.